On Thursday, October 1, I decided to pay Mr. Kamal Rashid, director of the General Directorate of Antiquities in Sulaymaniyah (GDAS), a short visit. He was thrilled and very happy to see me, “Osama have a seat…one of our French teams has just unearthed a clay tablet.” Rashid said. We were at the site of Tell (mound) Kunara (Arabic: تل كنارة; Kurdish: گردي كوناره). Tell Kunara (35°31’9.06″N; 45°21’35.07″E) was first documented in the 1940s. A survey was conducted by the General Directorate of Antiquities in Baghdad. 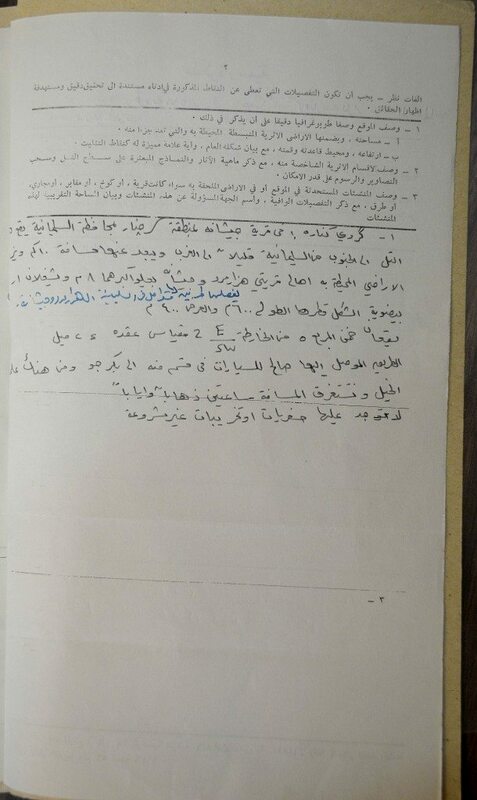 According to the Archives Department of GDAS, Mr. Sabri Shukri visited, surveyed the location and wrote an official memorandum describing the site on November 10, 1943. The second page of Mr. Sabri Shukri’s report on November 10, 1943. This page describes the location of Tell Kunara. The report consists of four pages. From the Archives Department of the General Directorate of Antiquities in Sulaymaniyah with permission. Never-before-published. Photo © Osama S. M. Amin. Since then the Tell was completely forgotten. In 2011, GDAS along with a French archaeological team started an archaeological survey on the upper part of Tanjro Valley and River. This survey was led by Professor Christine Kepinski and her assistant Aline Tenu. A total of 31 sites were surveyed; one of them was Tell Kunara. Its geophysical features revealed the foundations of a monumental building. 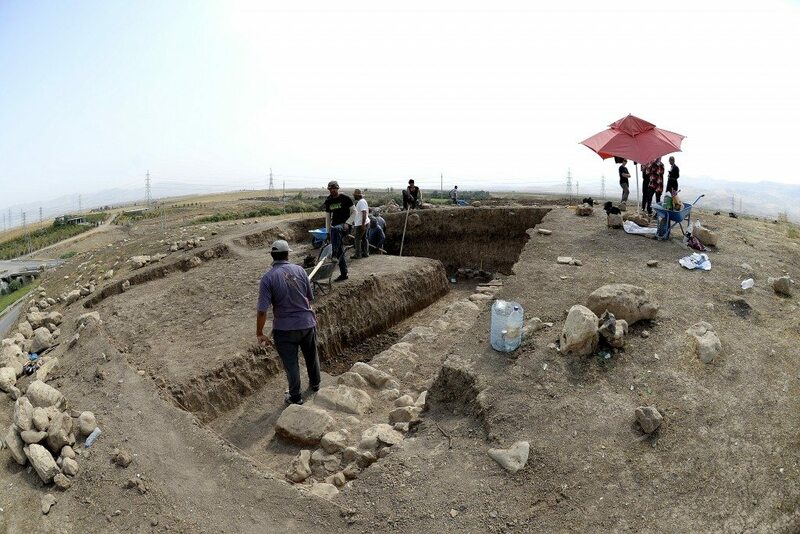 One year later, the team of the French National Center for Scientific Research (University of Paris), directed by the aforementioned scientists, started to excavate the site. The preliminary conclusion from the first season is that the site dates back to the early/middle Bronze period, 3000 to 2000 BCE. A small cylinder seal was found along with many fragments of pottery on the surface of the Tell and underneath it. Aline said, “Kunara is located on the right bank of one of the two main arms that form the Tanjaro River. This river forms the Diyala after joining Sirwan River, which comes from Western Iran. The site covers an area of 7 to 10 hectares and has a high western city that reached nearly 20 meters high. The lower town is on an alluvial terrace. Between the two mounds, a modern road runs and divides them and forms a natural depression. 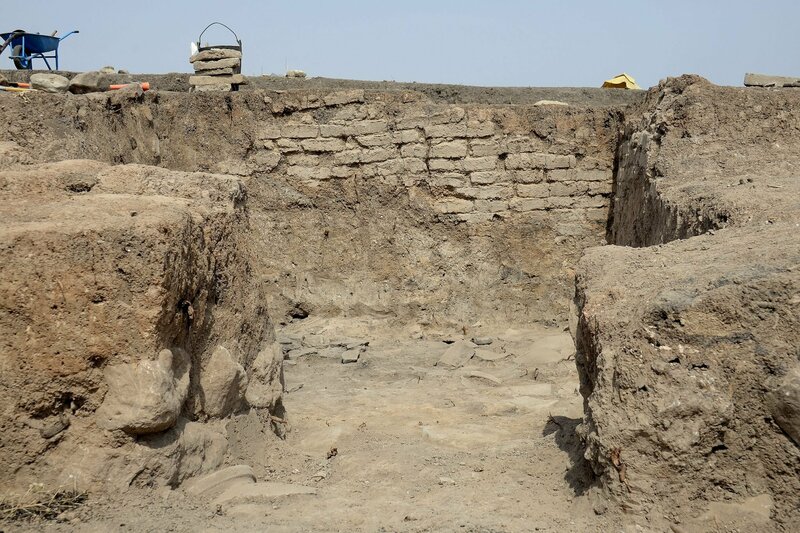 The results are still preliminary, but the architectural remains and artifacts discovered at Kunara can be dated to three main phases between 2300 and 1900 BCE; these represent Akkadian, Neo-Sumerian (Ur III), and Isin-Larsa periods. It seems that Kunara was inhabited by Lullubian people; ancient Mesopotamian texts and sources clearly documented the independence of this region from Mesopotamia. Given the importance of these buildings that have been uncovered, the care taken in their construction, and diversity of techniques used, we hypothesize that Tell Kunara has been one of the most important cities in the region at that time.” For further information see this blog entry, written in French, by Aline about Kunara. Aline Tenu looks at one of the pictures of the geophysical survey/geomagnetic topography of Tell Kunara. The survey had revealed the presence of large stone walls of a monumental building beneath the surface. One of the members of her team appears at her right side. Photo © Osama S. M. Amin. 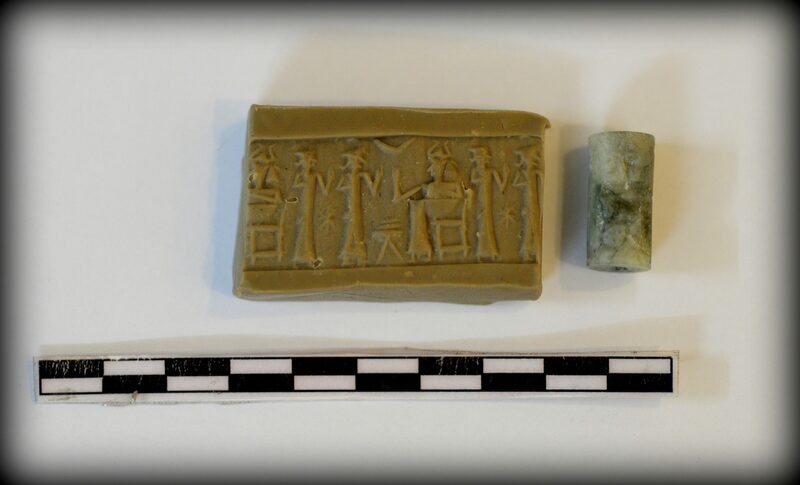 This cylinder seal was unearthed by the French team in 2012 (season 1) from Tell Kunara. The seal dates back to the 3rd millennium BCE. The impression reveals a deity (wearing a horned head cap) sitting on a chair. Before the deity, there is a low table and it seems that 2 objects are on the table. The deity greets 2 standing male figures. There is a star between the standing figures. Photo © Osama S. M. Amin. Season 2 of dig in 2013 passed smoothly. However, the ISIS expansion in 2014 prohibited the French team from visiting Iraqi Kurdistan. In September 2015, the team came back again and this time I was lucky! I got in! Two days later Mr. Rashid and I visited the location around 11 AM. 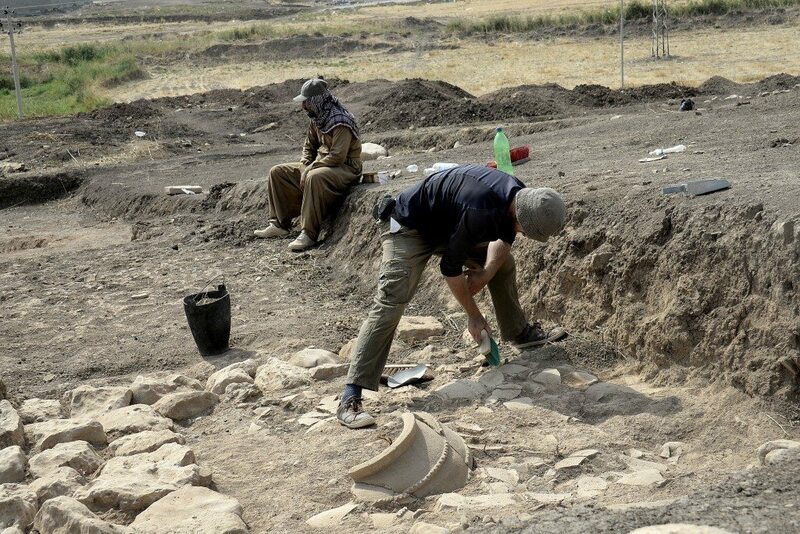 The French team was excavating the Tell helped by local Kurdish and Arab workers. One of the French archaeologists excavating pottery fragments, part of a large pottery pot can be seen. Photo © Osama S. M. Amin. Aline Tenu excavating this room and Kamal Rashid (director of the General Directorate of antiquities in Sulaymaniyah) stands beside her. 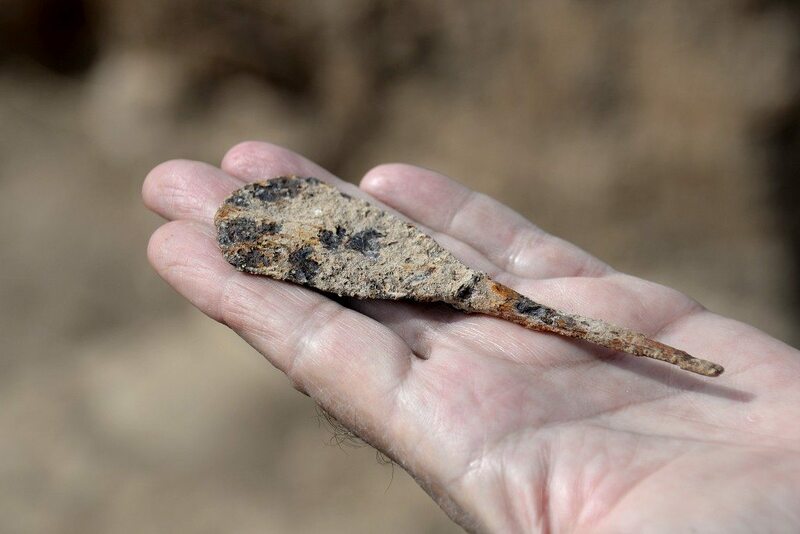 Note that many artifacts have been unearthed and have been put inside plastic bags. Photo © Osama S. M. Amin. Another trench was dug at the other side of the mound (Tell). These relatively large stones most likely represented a wall of some large building or of a city. Between these stones, animal bones were found as part of the wall’s construction. Photo © Osama S. M. Amin. 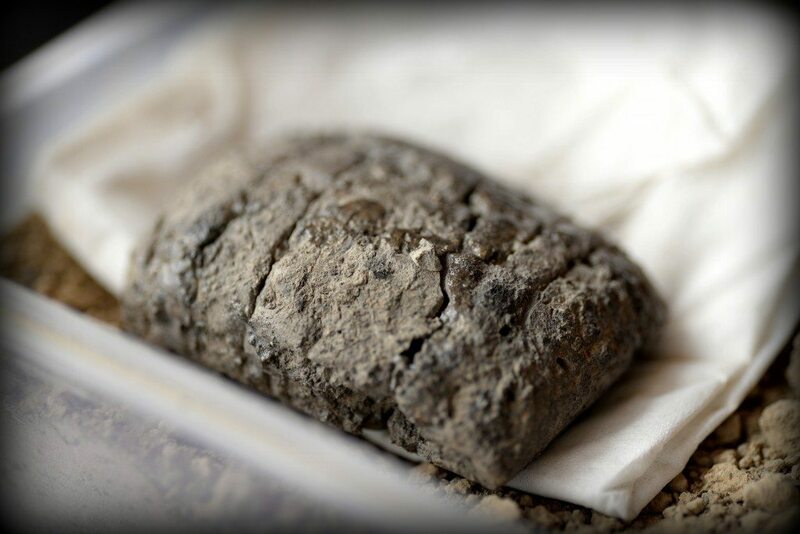 Aline told me a few days ago that the team found a completely intact, small clay tablet. The tablet is still covered with wet mud and needs time to dry so it can be cleaned. The tablet was found at the floor of this room; somewhere around the middle of it. The room’s floor contains many pottery fragments; some remnants of burnt coal were found. This might well represent a kitchen. Photo © Osama S. M. Amin. I told Aline about Ancient History Encyclopedia and that I intended to draft an article about their work. I asked her permission to take photos of the tablet, to which she replied positively! Afterwards, all of us headed to a traditional local restaurant. Just in time as I was very hungry and thirsty! I am very grateful to Mr. Kamal Rashid (director of General Directorate of Antiquities in Sulaymaniyah), Mr. Hashim Hama Abdullah (director of the Sulaymaniyah museum) for their unlimited help and cooperation. Also I extend special thanks to Mrs. Aline Tenu for the information she provided, allowing me to take photos of the site, and her kind permission to shoot and publish the tablet. 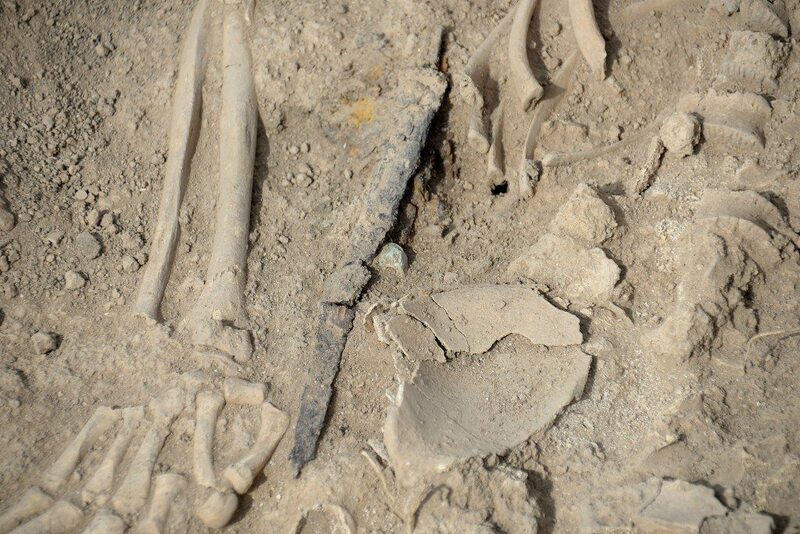 A relatively intact, complete human skeleton was found at the floor of one of the rooms (the one which immediately leads to the room of the tablet), very close and parallel to a stone wall. There is a dagger on the right side of the skeleton’s pelvis; this most likely represents a man (warrior?). The corpse was laid on its back longitudinally, not on one of its sides. Both arms and legs were straight. Both palms rested on the upper thighs. The overall arrangement of the body parts might well represent a formal burial. Photo © Osama S. M. Amin. This object was unearthed from Tell Kunara on October 3, 2015; the day of my visit! It is supposed to date back to the 3rd millennium BCE. I don’t know what is it! Mr. Kamal Rashid’s palm appears. Photo © Osama S. M. Amin. 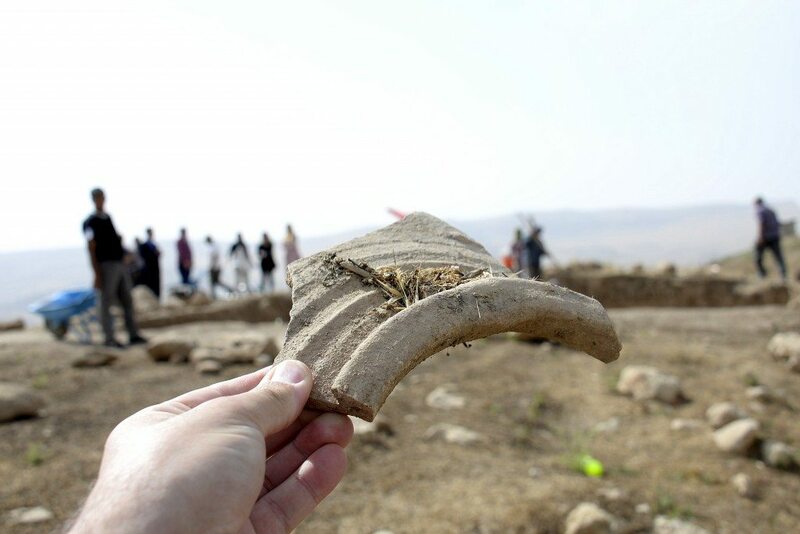 I’m holding this fragment of a pottery pot. The piece was on the surface of Tell Kunara already! Mr. Sabri Shukir’s report mentioned that the surface of the mound has many artifacts. This object belongs to the 3rd millennium BCE. Photo © Osama S. M. Amin. 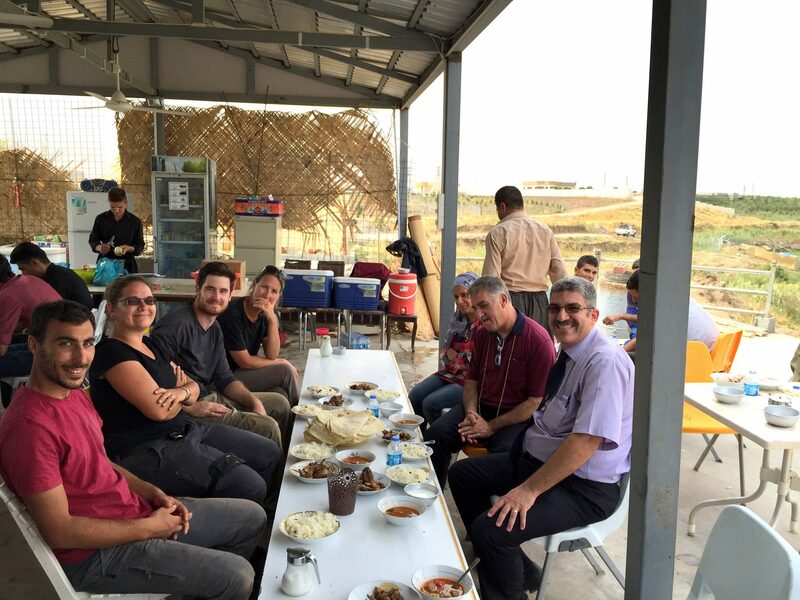 All of us are having lunch at a traditional local Kurdish restaurant. Photo © Osama S. M. Amin. Sulaymaniyah (or Slemani) Governorate lies within the northern area of Iraq and is part of Iraqi Kurdistan (or Kurdistan Region or Southern Kurdistan). All of these terms are used to describe the region. Neither the author nor Ancient History Encyclopedia endorses any specific term of the aforementioned ones.